The cold drizzle fell incessantly and the cars whisked by at speed. Joe Doran and his wife Mary, a quiet and gentle couple, were huddled by a campfire. Their home, a small canvas-covered wagon, was parked by the busy roadside on the outskirts of the city. Their donkey grazed in a nearby field and a cat purred on Joe’s lap as he spoke softly about his life. Joe was a Tipperary man and a tin smith by trade. 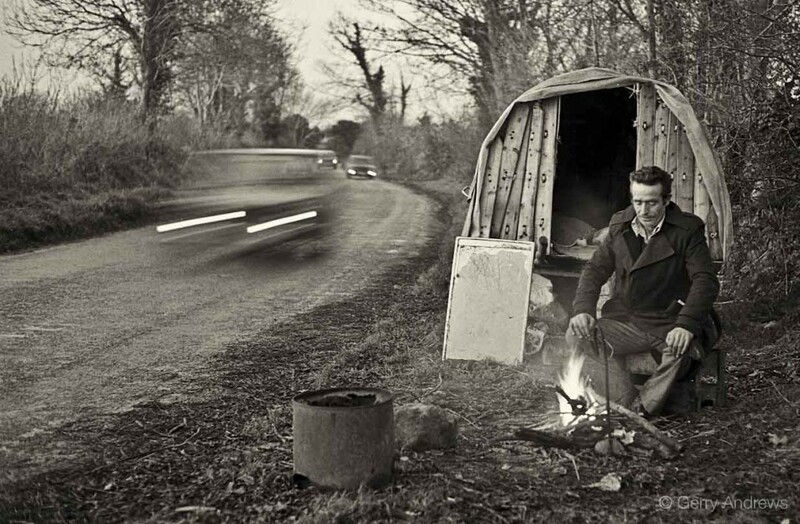 He spent his life on the road and he particularly feared the onset of the winter. They had no worldly possessions, save the donkey, their cat, a few pots and pans and their well-travelled cart. They had two children: a seven-year-old girl Dorothy and a nine-year-old boy named Eamon. Both were in an orphanage run by nuns at The Mount in O Connell St. They hoped to visit their children the following day but it was a long walk, the weather was bad and the road was dangerous. Joe recalled the ‘old days’ when people had time to talk and he had felt welcome wherever he went. Mary was shy and discussed the hardship of life on the road. Her eyes welled up with tears as Joe spoke about their children. She apologetically excused herself and said she would boil some water for a mug of tea. The symbolism of this poignant scene was lost on passers-by as they scrambled to purchase presents in the last minute holiday rush. There were no stars in the sky that night as darkness fell. The cold wind blew the flames of the campfire and the flickering light cast dark shadows on Joseph and Mary as they squatted by their donkey and cart on a lonely Limerick road that Christmas Eve.